It was another miserable, rainy Oregon weekend, and I didn’t know if I could stand to be inside for one more minute. Lately, there has been a pattern of cloudy weekdays, which are highly convenient for my bike commute to work, followed by torrential downpours on the following days I have free for my own devices. When I first moved to Oregon, I told myself that if I stayed inside whenever it rained, I’d almost always be inside. I don’t mind walking, biking, or gardening in the rain, but there’s something about boating in it that gets me down. My usual approach to boating is that if it is sunny, go for it. If it is cloudy, head out. If it might rain, bring rain gear, but if it is raining, stay home. Today I threw that idea out the window and followed it down to the river. I was desperate to row, so I donned my foulies, some neoprene booties, and wool gloves. 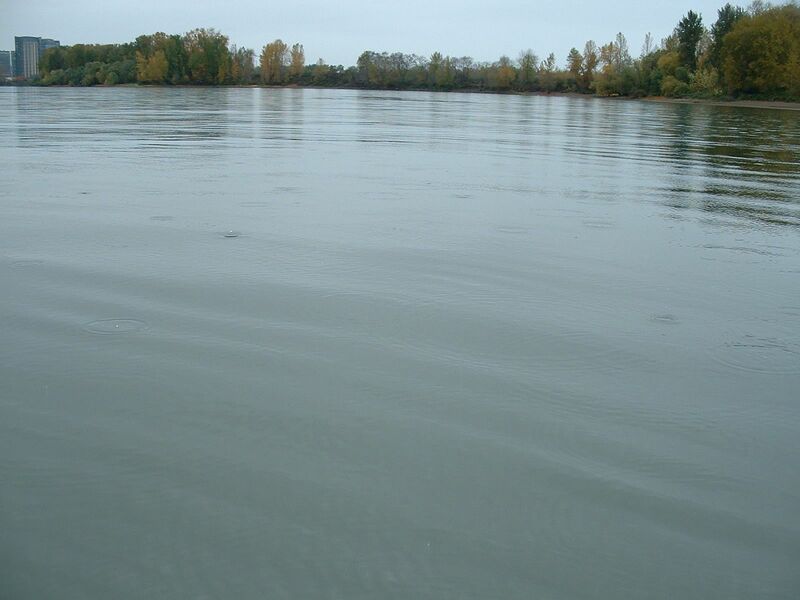 It started to rain harder as I trudged down the dock, but on the bright side, enough precipitation had fallen that it washed away the foul, goose poop that usually forms a series of landmines for unwary walkers. As I started rowing upstream, I was reminded how much the hull of a boat is like the mountains of a watershed, but instead of gathering water and focusing it to a stream that goes away someplace, it pools up in the bilge near my feet. Soon, I was warming up and feeling pleased that I wasn’t sitting inside staring out the window. Aside from an outrigger team who quickly left me astern, I was the only boat on the water and it was darn peaceful out there. The patter of drizzle on my head was mildly hypnotic. The rain ceased a little, so I decided to stop at the local dinghy sailing club to compare the success of various commercially made boat covers to the one I designed. 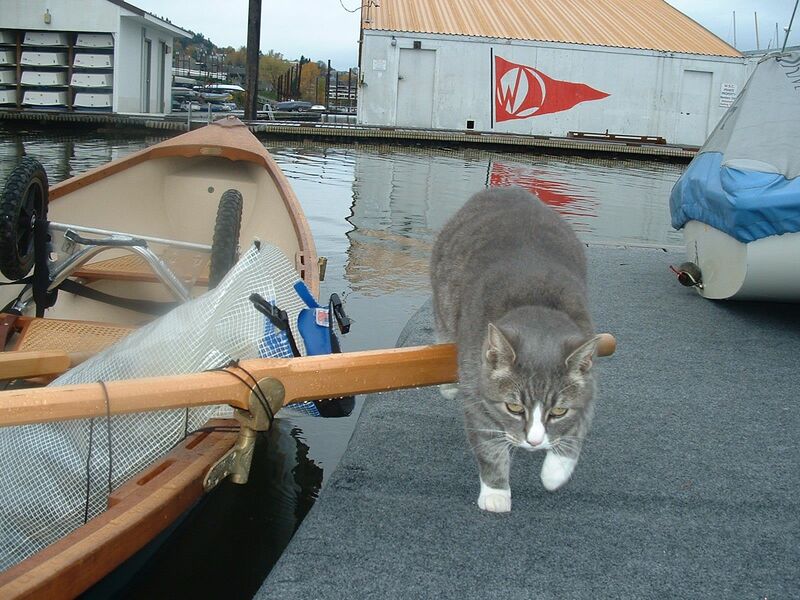 When I arrived, I was cheered by a cheerful greeting by Grace the water cat, the club’s mascot, who can often be found lurking on the docks. I wandered the deserted grounds finding that most boats were quite a bit more waterlogged than mine, which despite my frustrations with a few tiny leaks in my cover, made me feel quite successful. 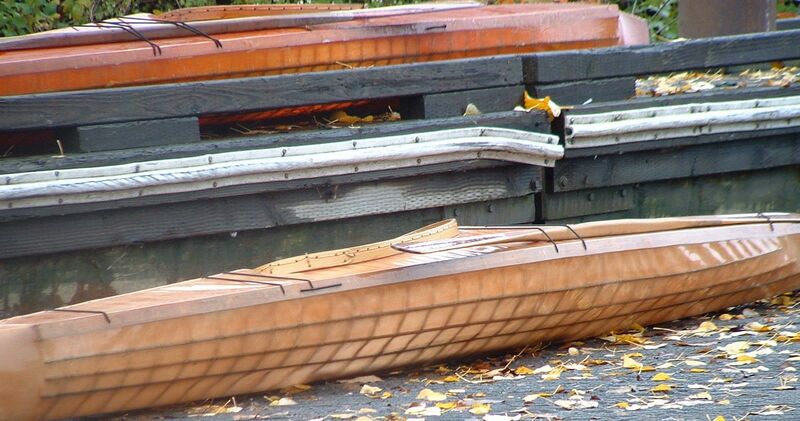 Next I discovered that the normally bustling launch ramp at Willamette Park was quiet enough that you could leave two beautiful skin-on-frame kayaks right on the drive lane without fear of destruction from a careless motor boat captain. What a fine day this was turning out to be. I turned downstream, catching a helpful push from the current, skirted around deserted Ross Island aglow with fall color and headed for home. When I pulled out at the dock, I wasn’t really that wet, not at all cold, and glad that I followed my own advice and got out in the rain. I drew that burgee design you see behind Grace. It is visible on Google Earth. Did you dump the water out of my boat cover? I thought Thistles needed to stay wet! Next time for sure. What’s that saying?… “no bad weather… just bad gear.” Sounds like you proved it correct. There’s my friend Gracie! When Mary and I attended the launch of the first St Ayles Skiff at that club, she picked me out from across the way, among 200 people and made a bee-line for where I was sitting. Yes, she’s quite the cat. Stay tuned for an article about her too!